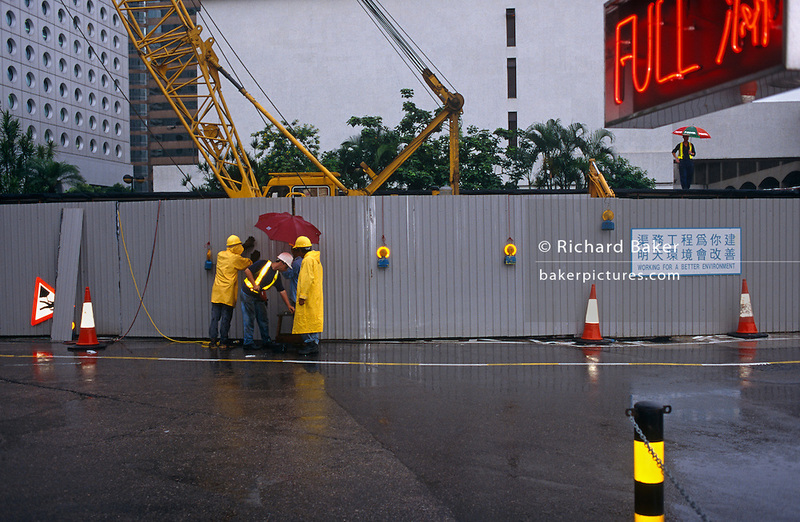 On the eve of transfer of law in Hong Kong from the UK to China, construction workers in Central Hong Kong carry on their tasks during a monsoonal rain shower on the last day of British rule. Some are dressed in yellow waterproof coats and hard hats, we see a British-style sign warning drivers of Men at Work resembling a man holding an umbrella. Lastly, on the right another man on a wall, also holding an brolley. In the foreground a car park sign states that the space is full in red letters and a local authority sign saying "Working for a better environment" is written in Chinese and English lettering. The transfer of sovereignty of Hong Kong from the United Kingdom to China, referred to as "The Handover" occurred at midnight on June 30, 1997, signifying the end of British rule, and the transfer of legal and financial authority back to China.